In the midst of this miserable “dumping ground” season, where we get unapologetically awful films like Dirty Grandpa and Point Break mixed with genuine awards contenders like The Revenant and Spotlight, it’s refreshing to get a film like Triple 9 which is neither good enough to be among the awards contenders nor bad enough to sink to Dirty Grandpa’s levels, yet is still thrilling and effortlessly entertaining enough to make it stand out in this dead season of film distribution. Director John Hillcoat has clearly taken his cues from the filmography of Michael Mann, specifically crime thrillers Heat and Collateral, to make one of his very own, where a group of criminals – including Chiwetel Ejiofor’s ex-soldier Michael, and siblings Russel and Gabe who are played by The Walking Dead’s Norman Reedus and Breaking Bad’s Aaron Paul respectively (making fans of their respective TV shows squee with delight in the process) – and a couple of corrupt cops – Anthony Mackie and Clifton Collins, Jr. – are being blackmailed by Kate Winslet’s delightfully vampy Russian-Jewish mobster into pulling off one more heist for her, which sounds like it’s impossible to pull off until one of them suggests a “triple nine”. For those not caught up in police lingo, a “triple nine” basically means “officer down”, which alerts the entire force to the scene, meaning that these guys can pull off their last stint with no real obstacles. They end up choosing cop newcomer Chris (Casey Affleck), Mackie’s new partner on the force, as the one to be killed – but this being a crime thriller where anything can happen and anyone can be killed at a moment’s notice, things don’t necessarily fall into line for our anti-heroes. Yeah, a lot of this plot is very familiar, from the “one last heist” motif to the over-the-top gangster villains, but if you’re one of those people who likes or at the very least appreciates this kind of template story when it’s done right, then you’ll absolutely get a kick out of it. We certainly did; even though we’ve seen this done way too many times in the past, it’s still incredibly intense when we see someone who clearly loves this style of filmmaking manage to do it almost faultlessly. Hillcoat definitely knows how to craft an action set-piece, whether it’s an opening bank heist that plays almost like a deleted scene from Mann’s Heat, or a later police foot chase within a Latino apartment block that gets more and more intense as the scene goes on, and they’re filled with such vibrant grittiness and genuine passion that it makes you forget that, architecturally, it’s probably no different to what we have seen in past films like this. Despite all that, the Australian director has somehow found a way to make even the most familiar of plot devices seem fresh and new, never letting up when it has to give the audience those beats we can recite off by heart by this point, nor when it faces the danger of slowing things down to a fault. Hillcoat is also very fortunate to have a fantastic ensemble cast put just as much enthusiasm into their roles as he has clearly done in his direction. Ejiofor, for instance, takes what could have been a very one-note character and turns it into something that’s actually really interesting, a guy torn between honour and civility that also has more personal ties to the enemy than any other member of his crew, thanks to his having a son with Winslet’s sister (Gal Gadot, soon to be seen in less skimpy clothing as Wonder Woman in Batman v Superman: Dawn of Justice); the part is written well enough, but it really is Ejiofor’s committed turn that truly elevates the material. Everyone else, from the ones we previously mentioned to the ones we didn’t, like Woody Harrelson as a flamboyant stars-and-stripes tie-wearing police detective trying to put the pieces together, or even Michael K. Williams who shows up in one scene as a transgender police contact (who, by the way, we know transgender people who actually act and sound like Williams does here, so his portrayal is surprisingly not that far off), does strong work in the shared amount of time they have together, and you can tell that this is a cast who absolutely believes in this material and are doing their utmost to make it as entertaining an experience as possible for the audience – and on that note, they’ve mostly succeeded. This being a John Hillcoat film, it doesn’t ease up on the violence either, which can sometimes be gory enough to put some people off, but for anyone with a stronger stomach it’s absolutely enthralling. Faces and sometimes other body parts are completely blown off, sometimes looking like something out of a straightforward horror film, but luckily it matches the overall grit and grimy atmosphere that it wishes to portray, and in the few moments that it can threaten to become a little cartoonish they’re not focused on too often, or at least enough to not make it a distraction. In attempting to tie up all its own loose ends, the film does tend to go on for a little longer than necessary at the end. It does offer a few decent twists along the way, but by the time one of them happens you’d expect it to fade to black right there, but it keeps going for at least another five minutes; the same with the next twist, and so on. 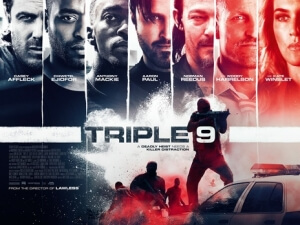 When it finally does end, it’s in a place that’s only semi-satisfying, not quite matching the quality of what came before it; but thankfully, there was enough of it in Triple 9 to leave you in an overall elevated mood by the time you exit the auditorium. Triple 9 doesn’t bring much that’s new to the familiar crime-thriller tropes it’s representing, but it manages to make them feel fresh and new all the same thanks to the lively and gritty direction by John Hillcoat and great work by a fantastic ensemble cast, who collectively make this a passionate and grimy love letter to past crime films like Heat and The Town.